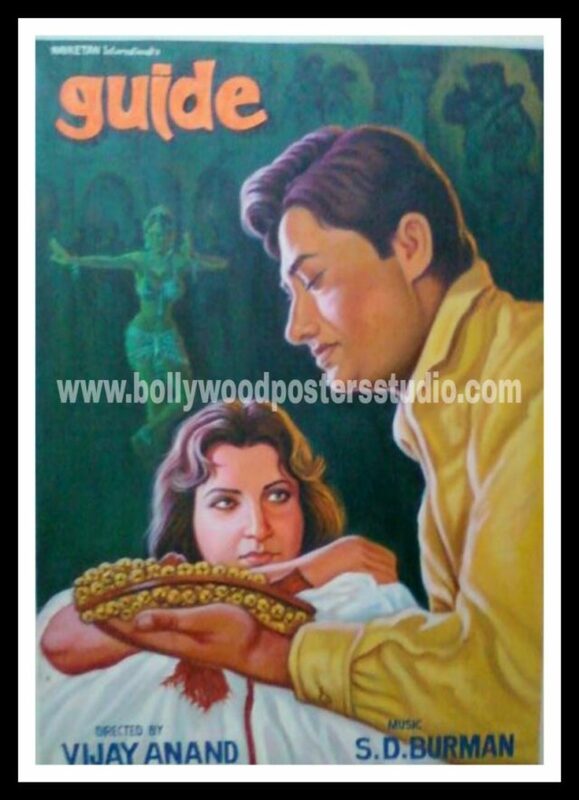 Are you looking for elegant Guide hand painted Indian movie poster? Contact us on mobile no. +919022034923 / +917666866256 or MAIL US ON: bollywoodpostersstudio@gmail.com Bollywood posters studio offers you the unique and museum quality hand painted posters by one of the finest artist of Indian movie poster at your door step at very affordable price. Bollywood posters studio offers you hand painted reproductions of old Indian Bollywood movie. Bollywood posters studio recreating the Bollywood magic on oil canvas, one of the largest leading brand committed towards making hand painted Bollywood Indian movie poster. Rare and hand drawn old Indian movie cinema poster for sale !!! by one of the finest artist of Indian movie poster. Poster painting is as old as Indian cinema, drew the viewer to the cinema hall. Hand painted Indian movie poster convey passion, love,intimacy, anger brilliantly on canvas. To resemble the personality and character of the movie on canvas is very painstaking job done by the artist, three cheers for our Indian movie film poster artist who had done their job tremendously outstanding and give us the purpose to keep the art alive forever.